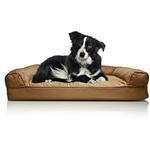 The Furhaven Quilted Orthopedic Sofa Pet Bed - Warm Brown gives your pet their own cozy lounging and sleeping spot! Sweet dreams! 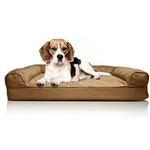 The Furhaven Quilted Orthopedic Sofa Pet Bed - Warm Brown provides maximum comfort for your pooch, cat, or any pet. The made in the U.S.A. inner orthopedic foam and quilted surface will keep your pup cozy through the night or through a cat nap and is perfect for the arthritic pet. Its side walls provide a head rest or comfortable spot to curl up in. This luxurious and stylish bed is sure to give your pooch the comfort they deserve! Furhaven Quilted Orthopedic Sofa Pet Bed - Warm Brown Customer Photos - Send us your photo! Posted On 12/06/18 by Sonya S from Catawba, NC Yes, Sonya S recommends this product! Our Hope loves her new bed. It matches our house too so an added bonus. Watching another dog for 10 days while her peeps vacation and that dog loves the bed also. I bought Ultra Paws dog boots.They are great, easy to put on and they stay on. Probably the reason they can be difficult to find in the right size color etc. My corgi has DM, so I bought them for protection. Very pleased with this purchase.